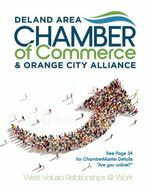 Our DeLand Area Chamber of Commerce and Orange City Alliance - "Lets Do Lunch" networking program is stronger than ever! The format will be a special treat too! The first Tuesday of every month will be a little different from the month before (you'll have to come to see what we mean). Come join us for a great meal, great networking and sharing time with really great people?.